If any of you are avid readers you’ll know the feeling of being in the middle of a few novels at once, of having a pile of unread books next to your bed and a bookshelf/kindle full of #mustreads that taunt and tempt. A couple of birthdays ago Hubby gave me the novel, A study in Scarlet. Having recently finished Stephen King’s On Writing, I rescued this little red book from the shelf last week. It’s a small volume of the who-dun-it-crime-scene-forensic-investigation persuasion. It is set at no. 221B Baker Street, London, in the year 1887. Present day Baker Street is quite disappointing by comparison – characterised by queues of tourists jostling to get into Madame Tussauds, a daily commuting crowd pouring in and out of the station and heaps of hooting traffic. I go to Baker Street almost every week for French lessons at Alliance Francaise. It’s all become a bit blasé, passé, old hat for me. 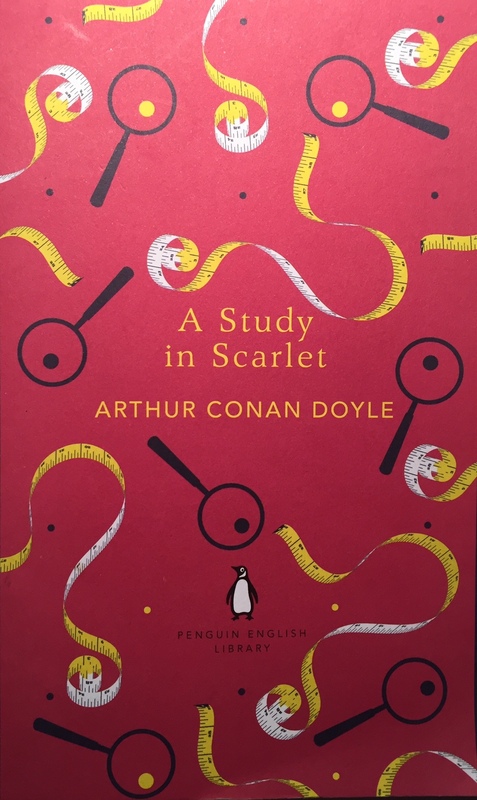 Reading A Study in Scarlet, drew me into Watson and Holmes’ London – of dark crimes, hansom cabs, cobbled streets, blood, Scotland Yard, keystone cops and cryptic clues. Books and history are how I scratch my time travel itch. Going back in time now to 2001/2002… when I first moved to London I was wide eyed and in awe of every corner and crevice of a city which was producing Shakespearean plays when South Africans where still running around in loin cloths. Each Saturday morning I became a tourist. I bought what was then called a ‘Weekend Travelcard’ for about £5. This ticket allowed you to travel as often as you liked all over the underground and on busses from midnight on Friday until midnight on Sunday. The weekend travelcard no longer exists. A pity. But with ticket in hand, my 26 year old self and my friends T & Wiseass (not his real name) tubed in to London from Sudbury Hill to go and see whichever wonder was next on our list (including 221B Baker street). Sometimes I miss my 26 year old, tourist self. One saturday I queued for entrance into the London Dungeons, was terrified by wondering plague victims, investigated the crimes of Jack the Ripper, was tortured and tried by a judge for the crime of treason, was shot by firing squad and my body taken by boat to be dumped in a rat-infested canal. I thoroughly enjoyed that day! Another day, I rode the lions in Trafalgar Square, then bought some bird feed and allowed pigeons to gather on my shoulders, in my hair and on my outstretched arms, each hand filled with tasty seeds. I took the left over seeds to the steps of St Pauls and offered the scraps to the pigeons there, all the while singing my own rendition of “Feed the birds” in honour of the raggedy old bird lady from Mary Poppins. Though I’ve never felt much like a grown up (at 5 foot 1 its hard to), I’ve recently begun exhibiting some worrying signs of losing touch with that wide-eyed girl. 1. Days out with Hubby. 2. Classic novels like Dickens, Austen, Gaskell, Conan Doyle, Bronte etc. 3. Travels to strange and foreign climes. 4. Black & white films like The Spy who Came in from the Cold, which Hubby and I watched last week. 5. Foreign visitors from South Africa and beyond. My latest adventure was brought about by a visit from our German friends who are with us for Easter. I’d always wanted to take a ride on the Emirates Air Line cable car from Canning Town to Greenwich, but just never seemed to get there. 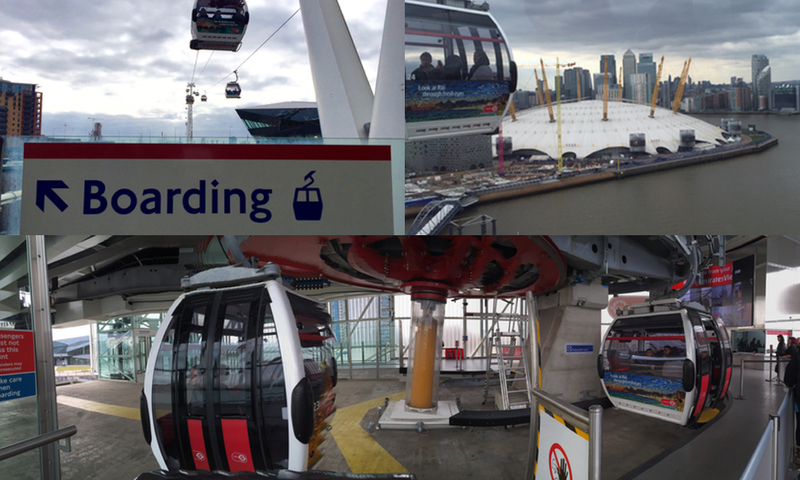 Finally, with our determined German tour guide and his family, Hubby and I traveled across to the East of London on the Docklands Light Rail and took the cable car high up over the thames – what a view! Here’s to being a tourist in your own city and time traveling via a good novel. P.s. Pigeons have been banished from Trafalgar Square and it’s illegal to feed them. You’ll be pleased to hear that I did not get pooped on when I was covered in pigeon all those years ago. P.p.s. In Jules Verne’s Around the World in 80 Days, the travellers actually do time travel. They work out that because they journeyed eastward throughout their 80 day journey, they gained a full day and Phileas Fogg won his 80 day wager. P.p.p.s. 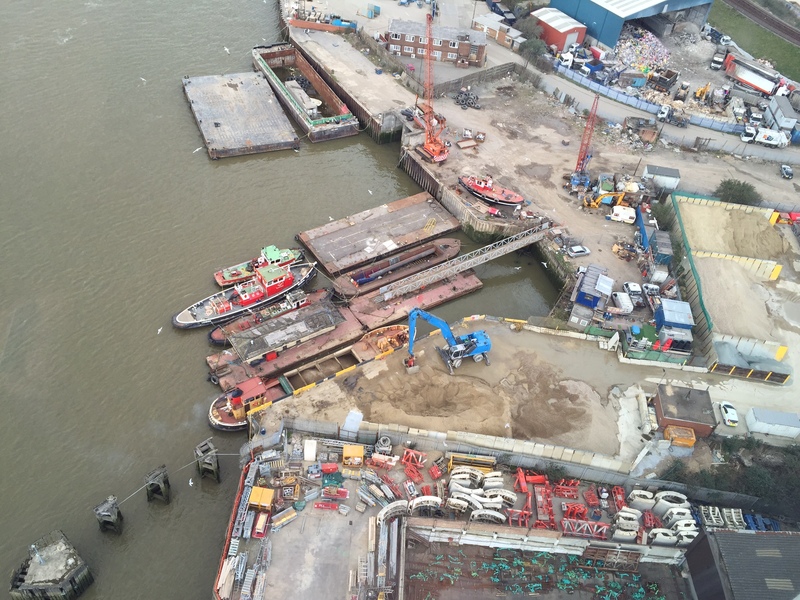 Hubby and I managed to spy some working barges in the London docklands from the cable car high above – great excitement! Please note that these are called flattop barges, not to be confused with river barges, which are like long house boats. P.p.p.p.s. 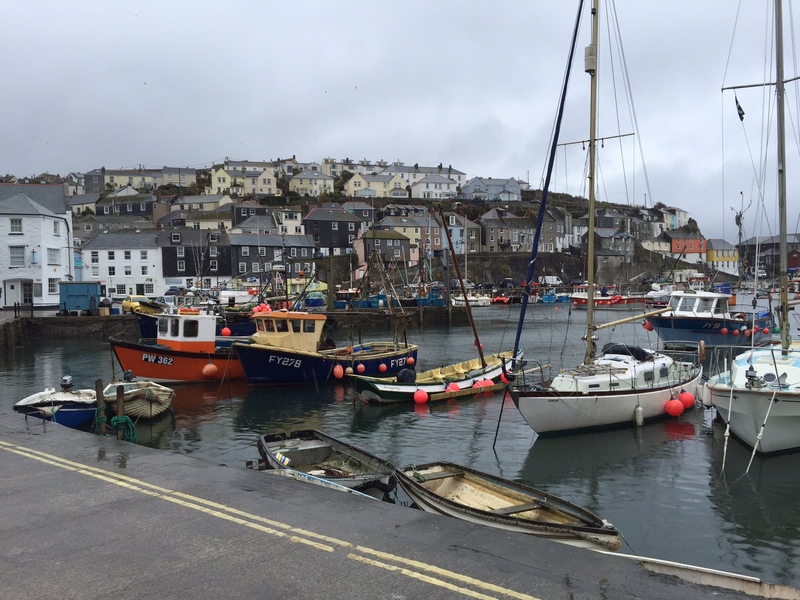 The picture below is the view out of my window at the Tea on the Quay in Mevagissey, Cornwall where I’m writing this blog. I’ve been on a bit of a business trip in the south west. Off to Devon for Easter tomorrow. Ahhh!! Your post brought back many fond memories and a bit of sadness that there is really very little like any of those to do in Durban!! But have been frequenting bot gardens a lot very early in the morning with my camera and enjoying it!! Hope you have had a wonderful time in Cornwall and Devon!! A wealth of places to visit and explore in London and around the UK.It is always great to share our stories to allow others to add to their list of “I have been there and done that”.Sometimes the best tourist guides are our own friends and family.Love the idea of keeping the wonder and imagination thriving on any visit to London Town.What a treat it would have been to be a chimney sweep in past years and have the pleasure of the great views of London for free while working.🎼Chim Chim in ey,Chim Chim in ey Chim Chim Chim che re .A sweep is as lucky as lucky can be.🎼.